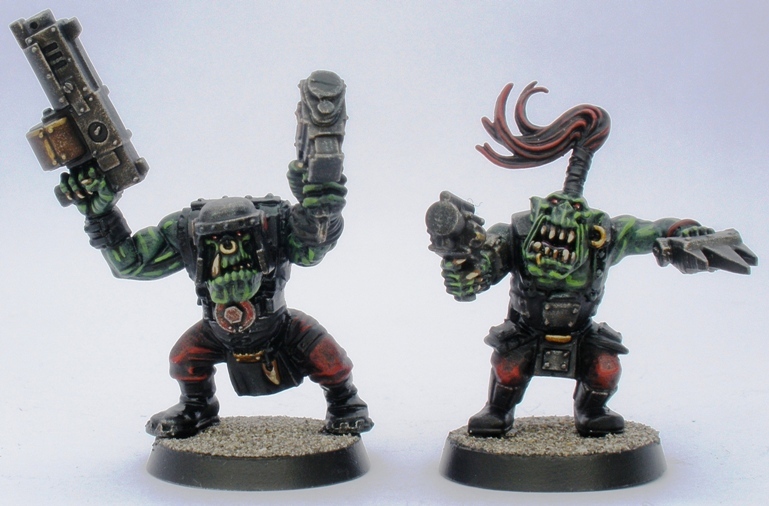 Continuing coverage of my Gorkamorka project, here are some more ork boyz. The guy on the right in the shot above is quite amusing to me. For some variety in painting I decided to make a Frankensteins Monster ork. This was in no small part inspired by the Frankenork Scenario available at tUGs. The monster in the scenario is an unarmed pacifist but I armed my ork abomination anyway (he will simply choose not to use the weapons should we get around to playing the scenario, just in case that damages your suspension of disbelief or something). The body and arms of the figure are from an old Heroquest ogre that I traded with SOS just under a decade ago. I added a slugga and the goofy meks head. I also added a couple of screws from a spectacle repair kit to the right shoulder, to increase the reference. The look isnt perfect, but its fun all the same. 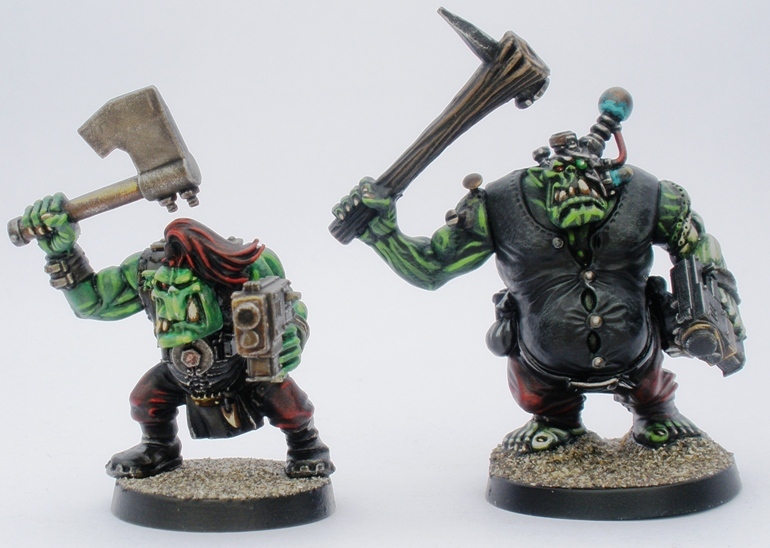 Above left is a ridiculously enthusiastic ork boy, while the guy on the right is an ork “yoof” (juvenile). The yoofs body is from the original GoMo plastic boyz set, which is more slight than the orks that have been doing the rounds this century. The heads supplied with the GoMo plastics are very dated looking now though, so I added a more modern head. The new head does possibly look a little large in comparison with the body, but its well within acceptable limits for me. Frankenork is very cool mate, love him. A fun variant on the theme alright. The mek head with the big copper conductor jammed in it sets the whole thing off quite well I think. I like your Frankenork! That’s pretty cool.